Lenten Question: What Does it Mean to Be You? Today I’ll share some thoughts about Lent from one of my favorite authors. Even if you’re not a Jesus-person and you’ve never given Lent a second thought, this could be a useful exercise for you. Lent — which begins the day after tomorrow — is a traditional time for self reflection and re-centering, and Frederick Buechner gives us food for thought and prayer in his book, Whistling in the Dark. “In many cultures there is an ancient custom of giving a tenth of each year’s income to some holy use. For Christians, to observe forty days of Lent is to do the same thing with roughly a tenth of each year’s days. After being baptized by John in the River Jordan, Jesus went off alone into the wilderness where he spent forty days asking himself the question what it meant to be Jesus. During Lent, Christians are supposed to ask one way or another what it means to be themselves. If this were your last day of your life, what would you do with it? Lent starts this week, which I know is very exciting news to you. OK, maybe not. Really? We *know* that, thank you very much, and we expend plenty of effort trying to forget it. And then to add insult to injury, they smear ashes on your face! Those Jesus people also talk about Lenten “repentance and sacrifice” and — ACK! — SIN. That whispered word and the shame with which it’s been imbued by some church traditions is probably the reason a lot of people reject religion altogether. I know it was the reason my mother did. “No man who doesn’t even know me is going to stand up there and tell me I’m a sinner. I’m a perfectly nice person,” she would say. And so she was. But the word “sin” — despite being used as a weapon to manipulate people and strike fear into their hearts — really only means “to miss the mark.” That’s not so bad, right? It means we’re not all we could be, and even my Mom could have owned that truth. For me, Lent is a time of great hope and expectation, because we get to press the re-set button. It’s a time to intentionally step back and take stock of our lives and decide how we want to change. It can be humbling to admit how much we “miss the mark,” yet it’s empowering to know that we have the power to change, if we have the will. Who am I, that you are mindful of me? This is Part Two of the story that I posted this morning, Executive Order Imprisons 110,000 People. I wanted to share this lovely remembrance that a reader wrote in response to the version I posted in my Daily Kos Diary. My community was incensed that their good citizens of Japanese ancestry were being deported. They implored the Federal Government to let their beloved laundry owner and workers, their favorite cafe owner and workers, and many other Japanese workers stay. They knew these good, honest, hardworking people, and did not want them to leave. So much so that when the valedictorian of the Juneau High School class of 1942 (my uncle’s class) held their commencement, the school painted one of the wooden folding chairs black and put it in John Tanaka’s place in the front row of the class (he had been awarded his diploma 2 months earlier when his family was sent to Minadoka, Idaho in early March). John Tanaka went on to enlist in the 442nd Regiment and fought in the Italian campaign where the “Go For Broke” unit had one of WWII’s highest casualty rates. Unlike many other communities on the West Coast, Alaska’s capital city took care to preserve the properties and businesses of our fellow citizens and helped them get back on their feet when they returned after the war. John worked summers in his family’s restaurant while he attended college and medical school. 2 years ago, we dedicated a bronze copy of that folding chair placed in the park next door to that school as a memorial to those who were deported, and to remind us that it should never happen again. Never again will we allow people to be imprisoned for who they are. Never Again. NEVER AGAIN. 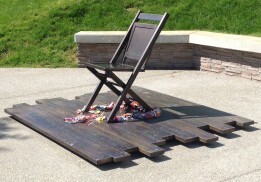 For more information and the full story of the Empty Chair, see The Empty Chair Project blog. Another reader of my Daily Kos blog pointed out that calling these “internment camps” is “whitewashing” what our country did. They were concentration camps, built with the intention of concentrating the “undesirables” in one place. Hence the quotation marks. And in case you missed it, the trump people are already citing these concentration camps as a legal precedent for their planned incarceration of immigrants (despite the fact that President Reagan issued an official apology for our World War II actions and paid each victim $20,000). The man currently occupying the Oval Office says he may or may not have supported the Japanese camps. Executive Order Imprisons 110,000 People! On this day in 1942, President Franklin D. Roosevelt signed Executive Order 9066, authorizing the removal of any and all people “as deemed necessary or desirable” away from “military areas.” Pearl Harbor had been bombed ten weeks before. The military decided that the entire West Coast was a military area. It also happened to be where most Japanese Americans lived. So off they went. A few months later, more than 110,000 Japanese Americans had been “relocated” (imprisoned) in internment camps built by the U.S. military. Sixty-two percent of them were American citizens. They lived in those prison camps for two and a half years. Then the “evacuees” were allowed to return to their homes . . . if they were still there. Wow. Isn’t that shocking? I’m so glad nothing like that could ever happen in America today.